"Intensive" work is needed to overcome differences on the Irish border and reach a Brexit deal, Theresa May says. 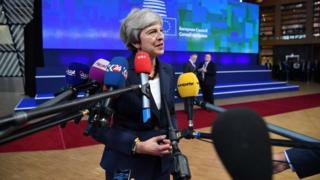 Speaking in Brussels, where she hopes to convince her counterparts to back her plan, the UK prime minister said "considerable progress" had been made in recent weeks. She has held meetings with key figures before addressing leaders ahead of their dinner this evening. A senior EU official suggested Mrs May had offered "nothing new" of substance. "There was a message of goodwill and readiness to reach an agreement, but I didn't perceive anything substantially new in terms of content," said Antonio Tajani, president of the European Parliament. Ahead of the summit, Labour said the government was "too weak and too divided" to reach a deal. 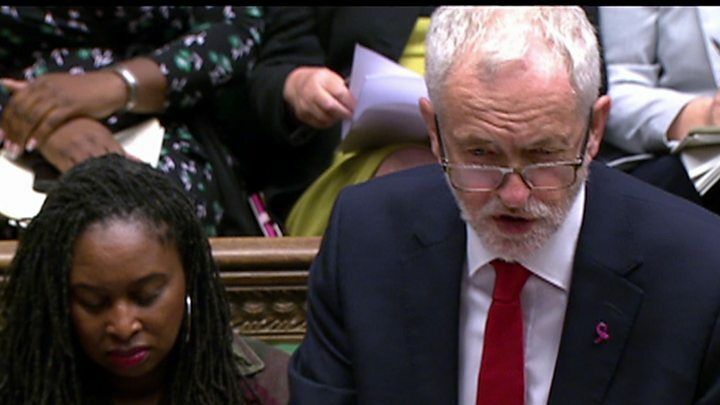 Earlier Mrs May and Jeremy Corbyn clashed over Brexit at Prime Minister's Questions, with the PM rejecting the Labour leader's claim that her planned long-term relationship with the EU, known as the Chequers plan, was "dead". This plan for Brexit was agreed by the Cabinet at the prime minister’s country residence, Chequers, in July 2018. It proposes tax or tariff-free trade with the EU, while leaving the UK free to pursue trade deals outside the EU. Under the plan, the UK would collect tariffs on the EU’s behalf for any goods entering the country but destined to be sent on to EU countries. Because EU tariffs had been collected, there would not need to be a separate border between Northern Ireland and the Republic. But the UK would have to follow EU rules, “the common rule book”, on things like food standards to avoid unnecessary border hold-ups. The plan also proposes ending the free movement of people, giving back the UK control over immigration rules. Former Brexit Secretary David Davis and former Foreign Secretary Boris Johnson both resigned their posts over the Chequers plan because they believe it means the UK would still be too closely tied to the EU. Both sides say they want to reach a deal, but preparations are taking place for what happens if they cannot agree by the time the UK leaves the EU on 29 March. In a new publication, the French government says Britons wanting to visit France, following a no-deal Brexit, could need a visa if they want to stay for three months or more. And those who were already living there could be treated as being in France illegally unless they have the necessary residence permits. It also said checks would need to be established on goods and people going to and from the UK as well as veterinary checks on animals and animal products. While the draft bill sets out the actions the government could take, it is not yet clear what the measures will be and the publication states any rules for expats could easily be adapted. German Chancellor Angela Merkel said there was still time to reach a "good and sustainable Brexit deal" but that her government was also preparing for no deal in areas like citizens' rights and customs. In the negotiations, she added, there should be a "significant difference between a membership of the EU and a partnership with the EU as a third country". Wednesday's European Council meeting was meant to be the occasion when the remaining 27 EU member states gave the green light for a special summit in November to finalise the terms of Britain's withdrawal from the EU. Both sides want to get an agreement in place within the next few weeks to avoid the prospect of the UK leaving without a deal on 29 March. But chief Brexit negotiator Michel Barnier is expected to say talks have failed to make the "decisive progress" the EU wanted to see before agreeing to a special summit. Ireland's Deputy Prime Minister Simon Coveney said: "I think what's more likely is that dates will be suggested, but that there won't be a commitment to a new summit unless there is a signal from the negotiating teams that there is something to sign off on. "And I think that's sensible. What we don't want to do is create drama around the build-up to a new summit date and not actually have something to sign off on." There is also speculation some EU leaders will suggest using a November summit for a no-deal planning session instead. The worst-case scenario for Downing Street is that EU leaders are so fed up with the UK position and what they see as the lack of reality, that on Thursday, they formally say they will hold a no-deal summit in November. That would switch them on to a track that would be hard to get off once in motion. One EU source expressed disbelief that Theresa May thought she could turn up on Wednesday with nothing new. It was simply crazy, in their view, to suggest that the ball can be lobbed back into the EU court. The best case - and it seems right now unlikely - scenario is for the EU to say that there is a deal in reach, so let's get a date in the diary for the sign-off next month. What seems more likely is a holding position. EU leaders could give some kinds of vague noises that both sides still want to pursue negotiations, so that the talks can get going again. One Brussels source said that while it is "time for choices", they could give the prime minister space and time to build a majority at home for a deal. Mrs May will address her fellow leaders on Wednesday evening before their dinner - before that she will hold one-on-one talks with European Council President Donald Tusk as well as Mr Juncker and Irish premiere Leo Varadkar. But she will leave before the meal where the EU leaders decide what to do next. Mr Tusk, president of the European Council, said on Tuesday he saw "no grounds for optimism" that the two sides could bridge their differences on the Irish border, but appealed for "goodwill and determination" to try and bring an agreement nearer. The border between Northern Ireland and the Republic of Ireland will become the border between the UK and the EU when the UK leaves the EU. Both sides want to avoid that border having checkpoints or other physical infrastructure to carry out checks on goods, but they can't agree how that should be done. They are discussing a "backstop" - a position of last resort, to protect an open border on the island of Ireland in the event that the UK leaves the EU without securing an all-encompassing deal. The EU's suggestion would see Northern Ireland remaining in the EU customs union, large parts of the single market and the EU VAT system, but Mrs May says that would effectively create a border between Northern Ireland and the rest of the United Kingdom. She suggested a backstop that would see the UK as a whole remaining aligned with the EU customs union for a limited time after 2020. 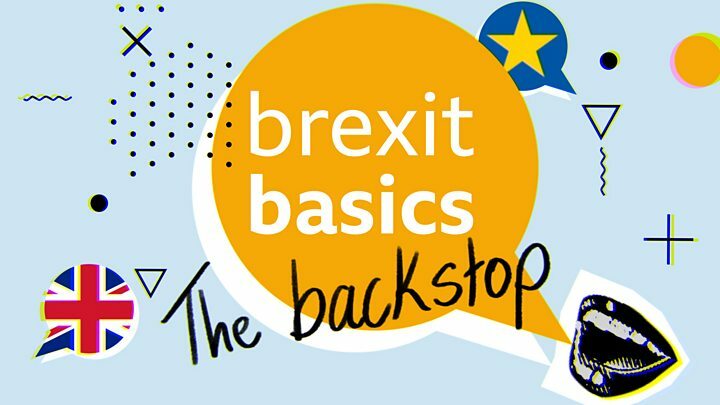 The EU also says any backstop plan should not have an end date - something Mrs May has previously insisted on, leading to the possibility of a "backstop to the backstop". The UK and EU negotiators have, separately, discussed extending the 21-month transition period by up to a year, to improve the chances of getting a full trade deal and reduce the chance of needing an Irish border backstop. Extending the transition period has never been ruled out by the UK government, but it is unlikely to be acceptable to Conservative Brexiteers. Downing Street has said they are not calling for an extension. On the eve of Wednesday's summit, former Conservative prime minister Sir John Major attacked Brexiteers, saying "those who promised what will never be delivered will have much to answer for." "They persuaded a deceived population to vote to be weaker and poorer. That will never be forgotten - nor forgiven." Sir John is among a host of former senior politicians, including Tony Blair, and ex-deputy prime ministers Lord Heseltine and Nick Clegg, stepping up calls for another referendum. They have written a series of articles in European newspapers backing a so-called People's Vote, with the option to remain in the EU. Sir John's remarks were met with barbed responses from Jacob Rees-Mogg and other Conservative Brexiteers who said he had compromised the UK's sovereignty by signing up to the Maastricht treaty in the early 1990s without consulting the people. Elsewhere, while some of Mrs May's MPs have urged her not to pay any money to the EU unless a deal is struck, Chancellor Philip Hammond - who backed Remain - is understood to have told the cabinet the UK could face a big bill at the end of any transition period even if no deal is reached. According to the Daily Telegraph, that bill could be £36bn.